Max’s scoliosis requires surgery before his curve impacts his internal organs and becomes life threatening. It means inserting metal rods along the length of his spine. It’s nasty, invasive surgery leaving a scar the full length of his back. He will require repeated surgeries every 3 to 6 months to lengthen the rods through his growth spurt from age 8 until12 and beyond. Ultimately he’ll likely require his spine fused solid and be left with life-long disability and pain management. 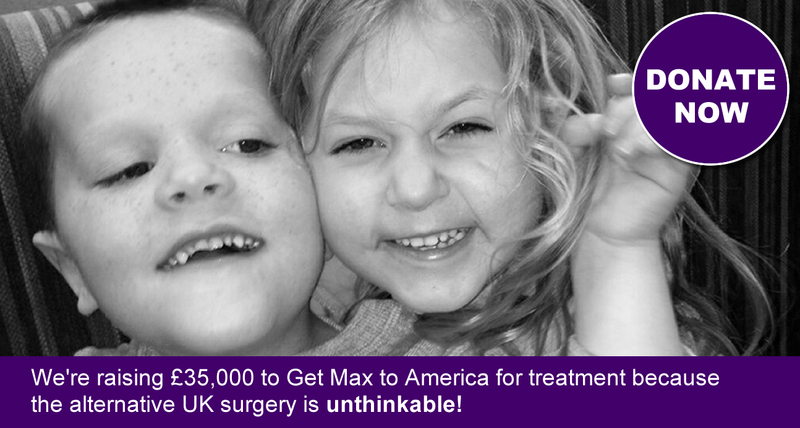 Max will travel to America to receive 3 weeks of intensive therapy and follow-up equipment and support. The total includes £3,600 for his 3D brace, £4,600 for his home traction chair, and approx £8,500 for an adapted wheelchair. He will then require daily visits to attend his exercises followed up by a return visit to the centre every three months. If he requires less-invasive​ keyhole surgery available in America we will raise more. Funds beyond Max’s need will role into our intended charity.